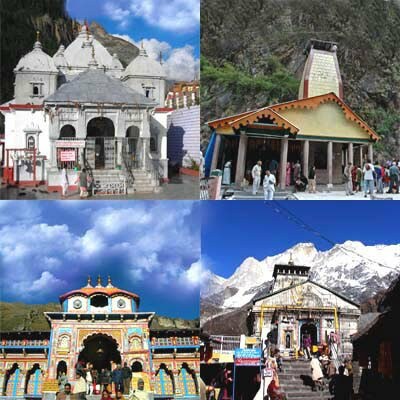 Chardham Yatra comprises of pilgrimage to Badrinath, Kedarnath, Gangotri and Yamunotri in Uttarakhand, India – the Char Dhams. Chardham Yatra 2019 opening date is May 7, on Akshaya Tritiya day – Gangotri and Yamunotri temples opens on May 7. Badrinath Temple will open on May 10 and Kedarnath Shrine on May 9, 2019. The closing dates of Chardham Yatra is during the Diwali period – October 27, 2019. These important shrines in Hinduism remains closed for major part of the year due to snowfall (October to April). The temples usually open in the month of April for a six-month period. During the Chardham Yatra period, Garhwal Mandal Vikas Nigam (GMVN) conducts spiritual tour to the important shrines in the Chardham region. Online reservation facility is also available. Helicopter Services are also available from Agastyamuni to Kedarnath and Badrinath. Gangotri, located at an altitude of 3200 meters, Yamunotri, at an altitude of 4421 meters, Badrinath, at an altitude of 3135 meters, and Kedarnath, at an altitude of 3580 meters, attract more than 2 million visitors each year from India and around the world. Why is Chardham Yatra Important in Hinduism? Chardham Yatra is considered important in Hinduism because the pilgrim who undertakes the pilgrimage is liberated after death and is never reborn (Skanda Purana 2.11 - 20). Pandavas of the Mahabharata is believed to worshiped in the Chardham. It must be noted here that the visit to four important temples dedicated to Lord Vishnu is also known as Char Dham Yatra and this involves visiting the shrines at Puri, Dwarka, Rameshwaram and Badrinath.